Fans don’t have to wait long for the action inside the Octagon to jump off in June as business gets underway on the first of the month in Utica, New York with a rare Friday evening fight card. Headlined by a pivotal bantamweight clash between Top 5 talents Jimmie Rivera and Marlon Moraes, the 13-fight event also features a showdown between surging lightweights Gregor Gillespie and Vinc Pichel, veteran welterweights Jake Ellenberger and Ben Saunders locking horns and TUF 26 contestants Sijara Eubanks and Lauren Murphy squaring off in a critical matchup in the women’s flyweight division. As always, the card also offers an opportunity to get a closer look at a handful of up-and-comers and new arrivals to the UFC roster, including one of the top prospects in the entire sport. Here’s a closer look at three athletes to keep your eye on this weekend. This is On the Rise: Utica Edition. One of the top talents on the East Coast regional scene for the last several years, Arce finally arrived in the Octagon back in January and kept right on rolling, collecting a unanimous decision victory over fellow newcomer Dan Ige to push his winning streak to six. Brandishing crisp striking and excellent footwork, the former Ring of Combat featherweight champion outworked Ige from range, building upon his victory on last summer’s Contender Series to establish himself as one to watch in the deep and talented featherweight ranks. After debuting in Boston, the Tiger Schulmann product returns to the Tri-State area for his sophomore appearance in the UFC cage, taking on Daniel Teymur in the second bout of Friday’s main card. Sweden’s Teymur suffered the first loss of his professional career last time out in his Octagon debut, starting hot, but fading down the stretch against Danny Henry. But with his debut in the rearview mirror and competing alongside his brother David, who takes on Nik Lentz, you best believe Teymur will be looking to get back on track in this one. If Arce can replicate the effort he put forth in his promotional debut (or improve upon it) and push his winning streak to seven, the promising 28-year-old will take another step forward in the competitive 145-pound ranks and set himself up for bigger and better in the second half of the year. The 25-year-old Torres has been considered one of the top prospects in the sport for the last few years. After going 25-1 as an amateur, including winning a pair of amateur World Championships, the Chicago native transitioned to the pro ranks and has maintained his winning ways. He won the Titan FC flyweight title in his third professional fight and successfully defended the belt against former UFC fighter Pedro Nobre before moving up to bantamweight and claiming gold there as well. 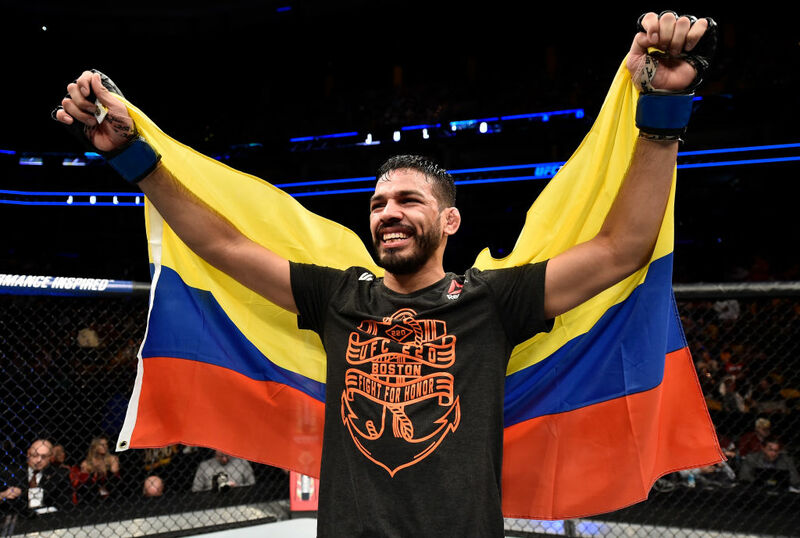 Earlier this year, Torres dropped back down to flyweight, defending his title against Alberto Orellano in February to push his record to 7-0 and now he’s finally set to make his Octagon debut. Stepping in for Hector Sandoval, “Shorty” gets a chance to make an instant impression in the 125-pound ranks by taking on Jarred Brooks, who returns after suffering the first loss of his career last October in Sao Paulo, Brazil. There has been a ton of hype surrounding Torres during his impressive run under the Titan FC banner and maintaining his unblemished with a convincing win over a dangerous and highly motivated talent like Brooks could very well put the talented new arrival in the fast lane towards contention going forward. Following a pair of successful title defenses under the Cage Warriors banner, Wood received the call to compete on the biggest stage in the sport. Friday night, “The Prospect” gets tossed into the deep end of the bantamweight division with a debut showdown opposite Brazilian veteran Johnny Eduardo. Riding a five-fight winning streak where the last three stoppages have come in the opening five minutes, the 25-year-old Wood has been opening eyes across the Atlantic. While his triumph over former UFC stalwart Vaughan Lee may be the most recognizable victory on his resume, Wood’s walk-off finish of Luca Iovine last time out was a sight to behold and the performance that prompted his call to the UFC cage. Now he’ll get the chance to prove himself against the best in the world and it won’t be an easy start, as Wood squares off with 39-fight veteran Eduardo, who has shared the cage with some of the top bantamweight talents in the UFC. If the British newcomer can waltz into the cage and dispatch the seasoned, savvy veteran, he’ll stamp himself as a future player in the 135-pound ranks right out of the chute.